This custom home floor plan combines the flavor of a vintage Southern cottage with the conveniences of today. A welcoming front porch and charming details give this home memorable curb appeal. From the rocking chair front porch to the twin front gables clad in charming shake siding, the exterior of the Sycamore recalls the timeless cottages of another era. 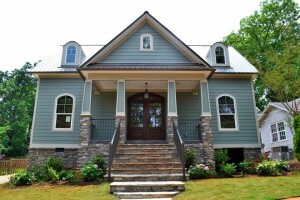 But step inside to a custom home floor plan that lives for today. A large great room provides all the space a family could need, and the flow to the dining room and kitchen make it an entertainer’s dream. Columns give definition to the spaces without closing them off, and help make the inside just as memorable as the exterior. The bright and cheerful kitchen enjoys views to the back yard and access to the outdoor living area, as well as a walk-in pantry, and an over-sized laundry room offers even more storage possibilities. Two family bedrooms are located at the front of the house. Plenty of closet space and an adjoining hall bath make them perfect for children or guests. 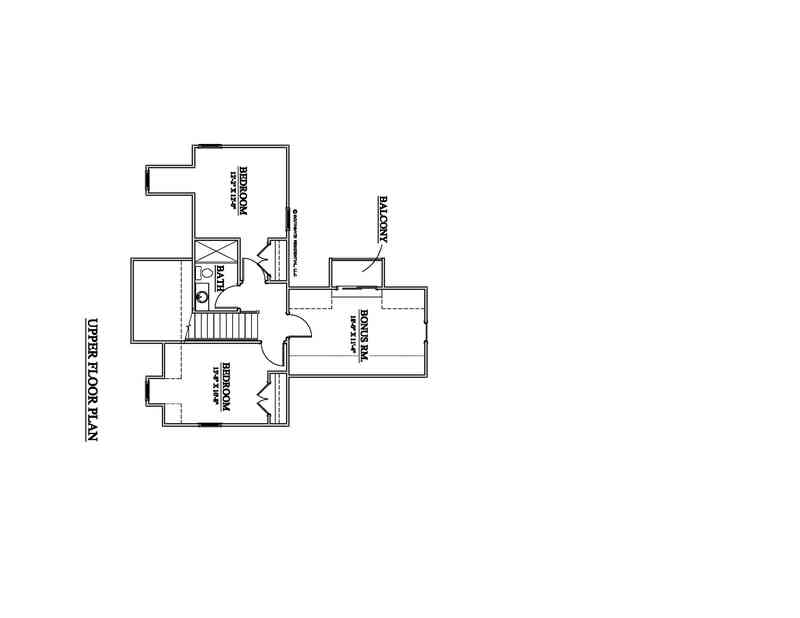 The split plan places the master bedroom at the rear–secluded in it’s own private corner of the house. A large walk-in closet, plenty of light, and a bathroom with his and hers sinks completes the suite. 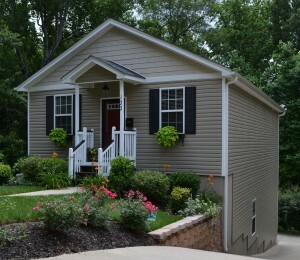 Efficient use of space and a compact footprint make for affordable luxury in this adorable home. 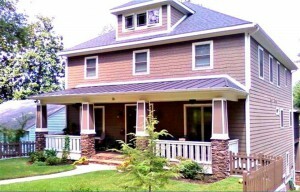 Handsomely proportioned with charming cottage details, the exterior is sure to be a head turner. An open custom home floor plan is perfect for entertaining or a quiet evening at home. The kitchen is thoughtfully laid out and features an open counter connecting it to the great room beyond. Just steps away is the airy dining room, which accesses a large deck through a wall of sliding glass doors. A two-car garage is a welcome amenity for storing the family’s cars and more. The bedrooms are nestled at the other end of the house, the master retreat features a walk-in closet and the private master bath’s dual sinks make the morning routine easy! Two more bedrooms share a hall bath and enjoy plenty of closet space. The laundry area is perfectly positioned, and two hall closets provide extra storage for linens, games, or seasonal items. 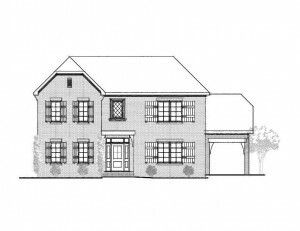 Conceived as a family compound, this European influenced custom home floor plan features a 3,000 square foot main house and an oversized garage with a two bedroom guest suite above. The two structures form a private courtyard at the rear of the property, allowing the owners to create an in-town oasis complete with pool, firepit, and outdoor kitchen. 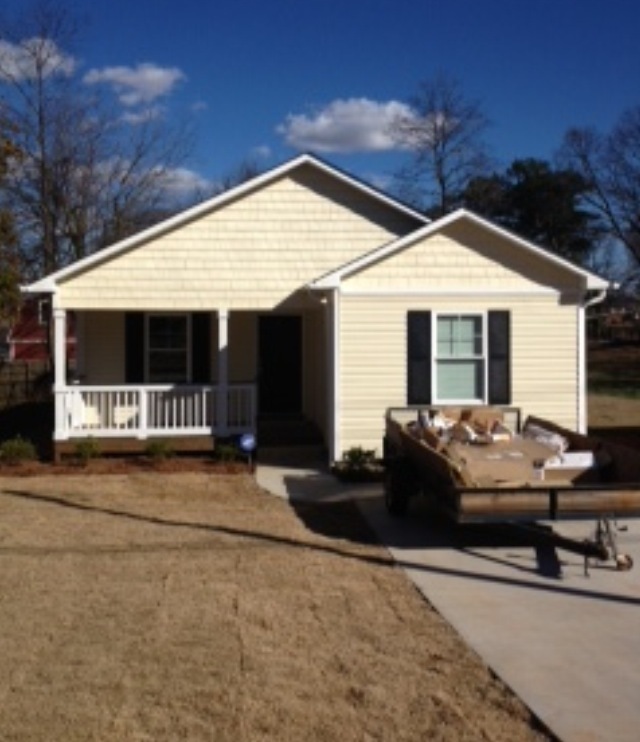 The painted brick main house pairs with board and batten siding on the garage. 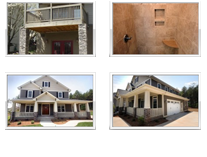 Decorative timber work, cast stone accents, and brick corbels are details found on the older homes in the neighborhood, insuring that the new house blends into the fabric of the community. The challenge of meeting the client’s needs on a small infill lot required careful space planning. Each space was analyzed and designed to be the perfect size for it’s function. The front door opens to a gorgeous foyer. The staircase is set into an arch and features beautiful woodwork and newel posts. It is flanked by a home office and a charming living room with fireplace and built in bookcases. From that room, an oversized hall serves as another office and an efficient mudroom allows the homeowners a place to organize mail, charge their devices, and store leashes, coats, and umbrellas. At the rear of the house, a large eat in kitchen features a tray ceiling, corner fireplace, and a view to the backyard. A large island is perfect for serving and prep. Adjacent to the kitchen is the large family room. With a soaring ceiling, built in bar, and space for a pool table, the room is ideal for entertaining. 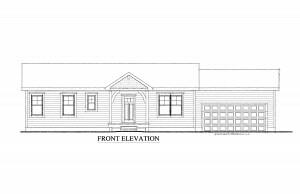 Rounding out the first floor is the master suite, a comfortable retreat with detailed ceiling and fireplace, along with a large walk-in closet and comfortable bathroom with a large glass shower. Upstairs, two large bedrooms share a Jack and Jill bath complete with dual sinks, and separate tub and shower. 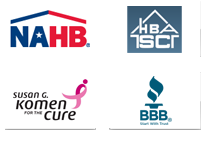 Several closets, as well as access to generous attic space, insure plenty of storage potential. Across the courtyard is the garage and guest house. 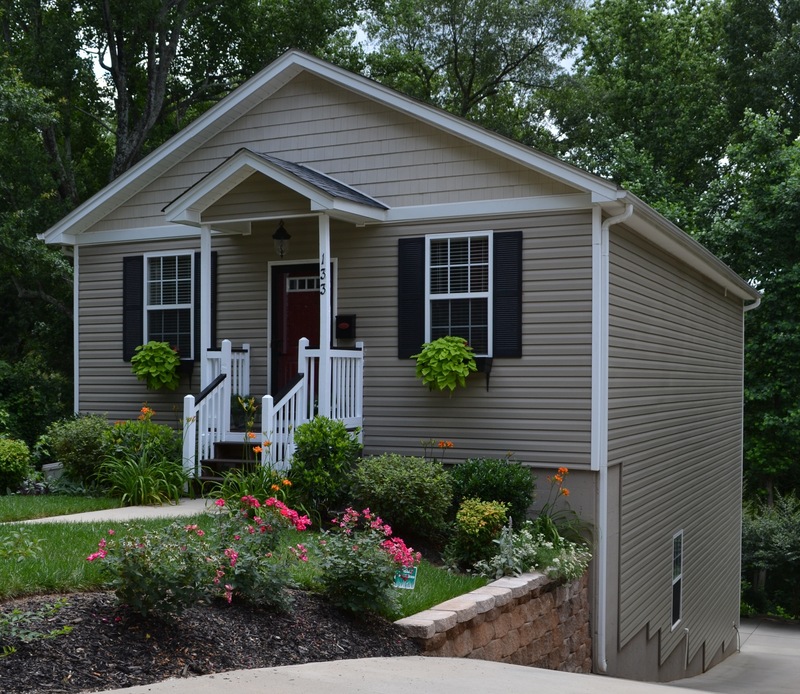 Large enough for two cars, plus storage and workshop space, the garage also features a first floor bathroom, perfect for use by swimmers, and a covered porch that extends the outdoor entertaining area. Upstairs, the guest suite is really a fully contained two bedroom apartment, complete with a compact kitchen and a deluxe bathroom with oversized shower. 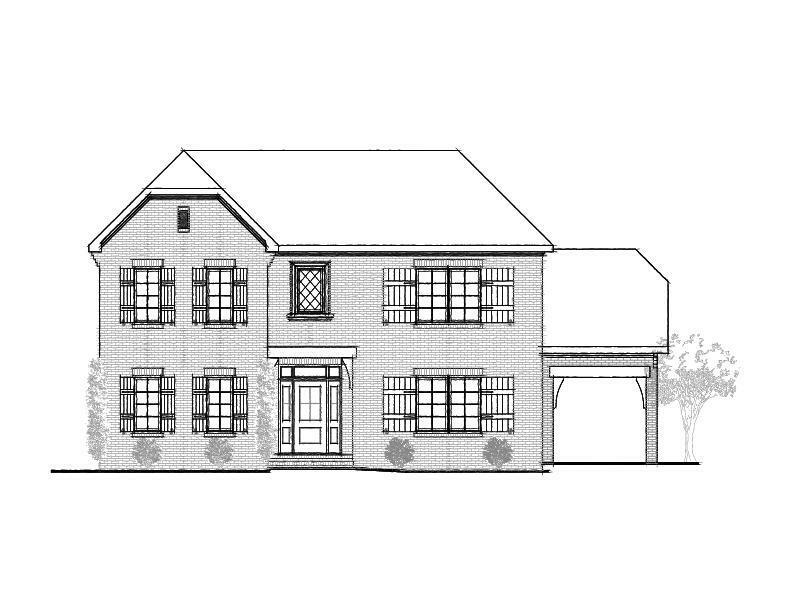 Built on the narrow site of a vintage mill house, this custom home floor plan was carefully designed to blend into it’s charming neighborhood. By breaking the mass of the house into smaller forms, proper scale was achieved. Lowcountry and craftsman design cues combine to create a memorable cottage like facade. Inside, a graceful foyer leads past an office and first floor bedroom suite to the heart of the home. A large great room opens to the dining area and knockout kitchen, complete with banquette seating at the island. A coffered ceiling and corner fireplace add detail to the space, and a wall of glass overlooks the house’s central courtyard. Situated at the rear for privacy is the sumptuous master suite. An oversized bedroom, dual walk in closets, and a spa like bathroom with fireplace create a haven for the owners. On the second floor, two comfortable family bedrooms share a bath, and a comfortable bonus room features a balcony overlooking the courtyard. A focus on “green design” was an important part of the construction of this house. Sustainable materials (such as the dramatic bamboo flooring) and earth friendly systems (rainwater is collected from the gutters for reuse) were used throughout. 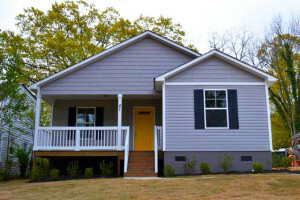 Classic styling of this affordable bungalow makes this custom home floor plan a hit! 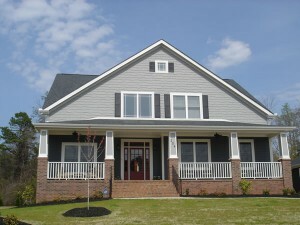 Huge front porch for enjoying southern days and nights. Upon entry you know you’ve arrived. 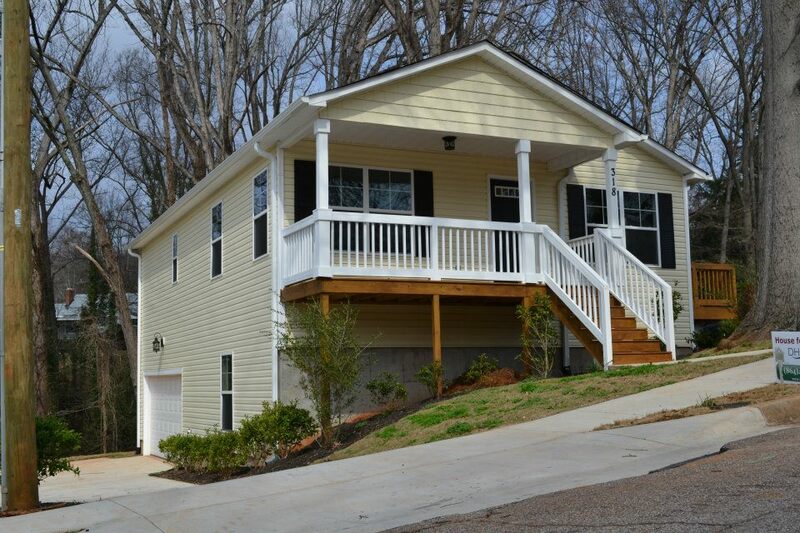 3 bedrooms, 2 bath with a bonus room downstairs. Perfect for kids who want their own space. 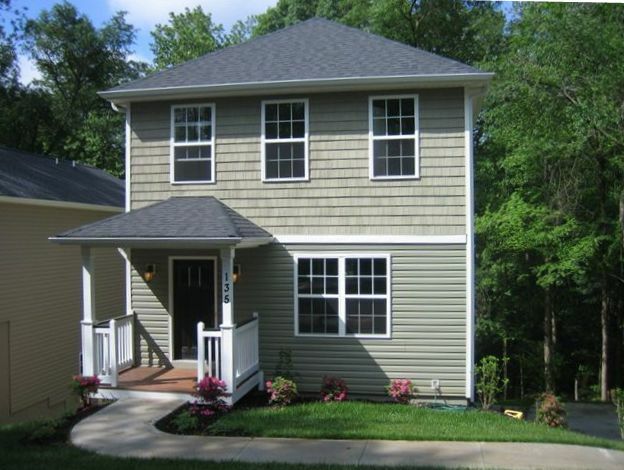 Open floor plan, kitchen, living room, dining, laundry off garage, rear deck, loft, HUGE bonus room and ample storage areas. 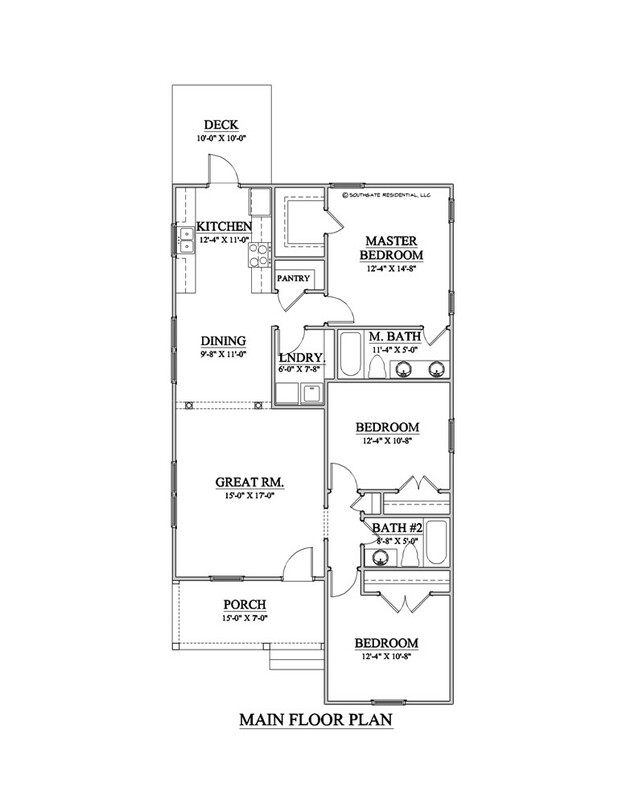 Master on main suite great for any age. Large walk-in his/ hers closet, double vanity and separate shower. 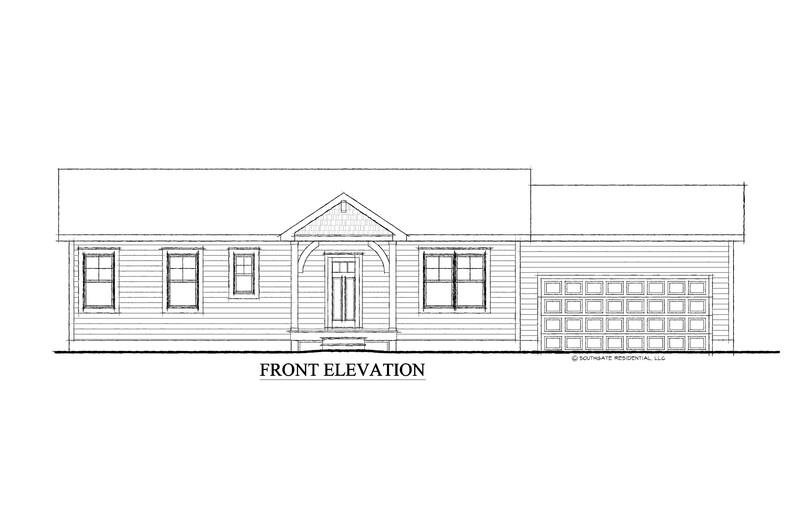 Comfortable cottage style custom home floor plan that has it all in a compact two-story space. Open floor plan that leads to a tranquil porch. 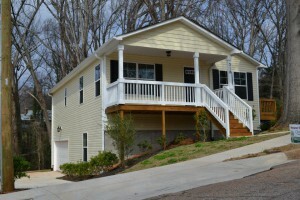 Three bedrooms, two and a half baths, dining area, laundry, garage, bonus room and eat at Island. Master has a generous walk in closet.